Striped, the area claimed by Venezuela. Map of Gran Colombia (1819) including the Esequibo region. 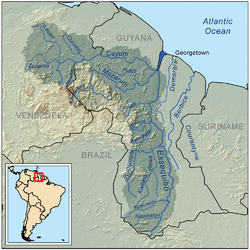 Guayana Esequiba (Spanish pronunciation: [ɡwaˈʝana eseˈkiβa]) is a territory administered and controlled by Guyana, however it is claimed by Venezuela. The territory was first included in the Viceroyalty of New Granada and the Captaincy General of Venezuela by Spain, but was later included in Essequibo by the Dutch and in British Guiana by the United Kingdom. Originally, parts of what is now eastern Venezuela were included in the disputed area which is not a controversy because of Venezuela new found claim. Some believe that this is because of the recent discovery of oil on Guyana’s shores. The portion today is under the administration of Guyana divides the area in six administrative regions (Barima-Waini, Cuyuni-Mazaruni, Pomeroon-Supenaam, Potaro-Siparuni, Upper Takutu-Upper Essequibo and Essequibo Islands-West Demerara), while Venezuela treats it as a single entity (Guayana Esequiba or "Zona en Reclamación"). This territory of 159,500 km2 (61,600 sq mi) is the subject of a long-running boundary dispute which was resolved but has not been inherited from the colonial powers and complicated by the independence of Guyana in 1966. The status of the territory is subject to the Treaty of Geneva, which was signed by the United Kingdom, Venezuela and British Guiana on 17 February 1966. This treaty stipulates that the parties will agree to find a practical, peaceful and satisfactory solution to the dispute. In 1648 Spain signed the Peace of Münster with the Dutch Republic, whereby Spain recognized the Republic's independence and also small Dutch possessions located east of the Essequibo River, which had been founded by the Dutch Republic before it was recognised by Spain. However, few decades after the Peace of Münster, the Dutch began to spread gradually west of the Essequibo River, inside the Spanish Guayana Province. These new settlements were regularly contested and destroyed by the Spanish authorities. The French Encyclopédie, published in the second half of the 18th century, noted the border as lying on the Essequibo river. It has been stated that the south bank of the Orinoco from the point of Barima, 20 leagues more or less inland, up to the creek of Curucima, is low lying and swampy land and, consequently, reckoning all this tract as useless, very few patches of fertile land being found therein, and hardly any savannahs and pastures, it is disregarded; so taking as chief base the said creek of Curucima, or the point of the chain and ridge in the great arm of the Imataka, an imaginary line will be drawn running to the south-south-east following the slopes of the ridge of the same name which is crossed by the rivers Aguire, Arature and Amacuro, and others, in the distance of 20 leagues, direct to the Cuyuni; from there it will run on to the Masaruni and Essequibo, parallel to the sources of the Berbis and Surinama; this is the directing line of the course which the new Settlements and foundations proposed must follow. However, no boundary between the Spanish and Dutch possessions was ever defined. Under the Anglo-Dutch Treaty of 1814, Dutch colonies of Demerara, Berbice and Essequibo were transferred to Great Britain. In 1831, Britain merged Berbice, Demerara, and Essequibo into British Guiana, with the Essequibo River as its west border, although many British settlers lived west of the Essequibo. In 1822 José Rafael Revenga, Minister Plenipotentiary of Gran Colombia to Britain, complained to the British government at the direction of Simón Bolívar about the presence of British settlers in territory claimed by Venezuela: "The colonists of Demerara and Berbice have usurped a large portion of land, which according to recent treaties between Spain and Holland, belongs to our country at the west of Essequibo River. It is absolutely essential that these settlers be put under the jurisdiction and obedience to our laws, or be withdrawn to their former possessions." In 1824 Venezuela appointed José Manuel Hurtado as its new Ambassador to Britain. Hurtado officially presented to the British government Venezuela's claim to the border at the Essequibo River, which was not objected to by Britain. However, the British government continued to promote colonization of territory west of the Essequibo River in succeeding years. In 1835, under the aegis of the Royal Geographical Society, the German-born explorer and naturalist Robert Hermann Schomburgk conducted botanical and geographical exploration of British Guiana. This resulted in a sketch of the territory with a line marking what he believed to be the western boundary claimed by the Dutch. As a result of this, he was commissioned in 1840 by the British government to survey Guiana's boundaries. This survey resulted in what came to be known as the "Schomburgk Line". Schomburgk's initial sketch, which had been published in 1840, was the only version of the "Schomburgk Line" published until 1886, which led to later accusations by US President Grover Cleveland that the line had been extended "in some mysterious way". The Line went well beyond the area of British occupation, and gave British Guiana control of the mouth of the Orinoco River. According to Schomburgk, it did not contain all the area that Britain might legitimately claim. Venezuela disputed Schomburgk's placing of border markers at the Orinoco river, and in 1844 claimed all of Guiana west of the Essequibo River. Also in 1844, a British proposal to Venezuela to modify the border to give Venezuela full control of the Orinoco river mouth and adjacent territory was ignored. In 1850 both Britain and Venezuela reached an agreement whereby they accepted not to colonize the disputed territory, although where this territory began and ended was not established. The dispute went unmentioned until 1876, by which point gold mines inhabited mainly by English-speaking people had been established in the Cuyuni basin, which was Venezuelan territory beyond the Schomburgk line but within the area Schomburgk thought Britain could claim. In 1876 Venezuela reiterated its claim up to the Essequibo river, to which the British responded with a counterclaim including the entire Cuyuni basin, although this was a paper claim which the British never intended to pursue. On 21 February 1881, Venezuela proposed a frontier line starting from a point one mile to the north of the Moruka River, drawn from there westward to the 60th meridian and running south along that meridian. This would have granted the Barima District to Venezuela. In October 1886 Britain declared the Schomburgk Line to be the provisional frontier of British Guiana, and in February 1887 Venezuela severed diplomatic relations. In 1894 Venezuela appealed to the United States to intervene, citing the Monroe Doctrine as justification. The United States did not want to get involved, only going as far as suggesting the possibility of arbitration. Official Map of the United States of Venezuela by L. Robelin 1890, which shows the Venezuelan historical claim to the region. The longstanding dispute became a diplomatic crisis in 1895. Venezuela hired William Lindsay Scruggs as its lobbyist in Washington, D.C. Scruggs took up Venezuela's argument that British action violated the Monroe Doctrine. Scruggs used his influence to get the US government to accept this claim and get involved. President Grover Cleveland adopted a broad interpretation of the Doctrine that did not just simply forbid new European colonies but declared an American interest in any matter within the hemisphere. British prime minister Lord Salisbury and British ambassador to the US Lord Pauncefote both misjudged the importance the American government placed on the dispute. The key issue in the crisis became Britain's refusal to include the territory east of the Schomburgk Line in the proposed international arbitration. Ultimately Britain backed down and tacitly accepted the US right to intervene under the Monroe Doctrine. This US intervention forced Britain to accept arbitration of the entire disputed territory. The Treaty of Arbitration between Great Britain and Venezuela was signed in Washington on 2 February 1897. This treaty specifically stipulated the legal framework for the arbitration, and its first article stated that "An arbitral Tribunal shall be immediately appointed to determine the boundary line between the United States of Venezuela and the Colony of British Guiana". The Treaty provided the legal framework, procedures and conditions for the Tribunal in order to solve the issue and reach to determinate a border. Its third article established that "The Tribunal shall investigate and ascertain the extent of the territories belonging to, or that might lawfully be claimed by the United Netherlands or by the Kingdom of Spain respectively at the time of the acquisition by Great Britain of the Colony of British Guiana, and shall determine the boundary line between the Colony of British Guiana and the United States of Venezuela". The Treaty also established the rules and principles to be followed by the Tribunal in order to draw the borderline. Venezuela argued that Spain–whose territory they had acquired–controlled land from the Orinoco River to the Amazon River in present day Brazil. Spain, according to Venezuela, only designated its claimed Guiana territory to the Dutch, which did not include much land within the disputed territory. Meanwhile, Britain, who had acquired the Dutch territory, stated that the disputed Guiana region was not Spanish because it was so remote and uncontrolled, explaining that the original natives in the land had shared the territory's land with the Dutch instead of the Spanish and were thus under Dutch and British influence. The rival claims were presented to a tribunal of five arbitrators: two from Britain, two from the US (representing Venezuela's interest) and one from Russia, who were presumed neutral. Venezuela reiterated its claim to the district immediately west of the Essequibo, and claimed that the boundary should run from the mouth of the Moruka River southwards to the Cuyuni River, near its junction with the Mazaruni River, and then along the east bank of the Essequibo to the Brazilian border. On 3 October 1899 the Tribunal ruled largely in favour of Britain. The Schomburgk Line was, with two deviations, established as the border between British Guiana and Venezuela. One deviation was that Venezuela received Barima Point at the mouth of the Orinoco, giving it undisputed control of the river, and thus the ability to levy duties on Venezuelan commerce. The second placed the border at the Wenamu River rather than the Cuyuni River, giving Venezuela substantial territory east of the line. However, Britain received most of the disputed territory, and all of the gold mines. The Venezuelan representatives, claiming that Britain had unduly influenced the decision of the Russian member of the tribunal, protested the outcome. Periodic protests, however, were confined to the domestic political arena and international diplomatic forums. Map of Guyana, showing the Essequibo River and (shaded dark) the river's drainage basin. Venezuela claims territory up to the western bank of the river. The historical claim by the UK included the river basin well into current-day Venezuela. "Great Britain, up to the time of the intervention of the United States, distinctly refused to arbitrate any portion of the territory east of the Schomburgk line, alleging that its title was unassailable. This territory included the Attacuri river and Point Barima, which is of the greatest value strategically and commercially. The award gives Point Barima, with a strip of land fifty miles long, to Venezuela, which thereby obtains entire control of the River Orinoco. Three thousand square miles in the interior are also awarded to Venezuela. Thus, by a decision in which the British arbitrators concurred, the position taken by Great Britain in 1895 is shown to be unfounded [...] The President of the tribunal in his closing address today had commented upon the unanimity of the present judgment and had referred to it as a proof of the success of the arbitration, but it did not require much intelligence to penetrate behind this superficial statement and to see that the line drawn is a line of compromise and not a line of right. If the British contention was right, the line should have been drawn further west; if it were wrong, the line should have been drawn much further east. There was nothing in the history of the controversy, nor in the legal principle involved, which could adequately explain why the line should be drawn where it had been. So long as arbitration was conducted on such principles, it could not be regarded as a success, at least by those who believe that arbitration should result in the admission of legal rights and not in compromises really diplomatic in character. Venezuela had gained much, but was entitled to much more, and if the arbitrators were unanimous, it must be because their failure to agree would have confirmed Great Britain in the possession of even more territory". The Venezuelan government showed almost immediate disapproval with the 1899 Arbitral Award. As early as 7 October 1899 Venezuela voiced her condemnation of the Award, and demanded the renegotiation of her eastern border with British Guiana: that day, Venezuelan Foreign Minister José Andrade made clear that the Arbitral Award was the product of political collusion and it should not be adhered to by Venezuela. After numerous bilateral diplomatic attempts failed to convince Great Britain of her seriousness to nullify the award, Venezuela denounced it before the first assembly of the United Nations, in 1945. On 26 October 1899 in a letter to a colleague, Severo Mallet-Prevost, the Official Secretary of the US–Venezuela delegation in the Tribunal of Arbitration, stated that the Arbitral Award was the result of pressures brought on the judges by the President of the Tribunal, Friedrich Martens. By 1949, the US jurist Otto Schoenrich gave the Venezuelan government a memorandum written by Mallet-Prevost, which was written in 1944 to be published only after his death. Mallet-Prevost surmised from the private behavior of the judges that there had a political deal between Russia and Britain, and said that the Russian chair of the panel, Friedrich Martens, had visited Britain with the two British arbitrators in the summer of 1899, and subsequently had offered the two American judges a choice between accepting a unanimous award along the lines ultimately agreed, or a 3 to 2 majority opinion even more favourable to the British. The alternative would have followed the Schomburgk Line entirely, and given the mouth of the Orinoco to the British. Mallet-Prevost said that the American judges and Venezuelan counsel were disgusted at the situation and considered the 3 to 2 option with a strongly worded minority opinion, but ultimately went along with Martens to avoid depriving Venezuela of even more territory. This memorandum provided further evidence for Venezuela's contentions that there had in fact been a political deal between the British judges and the Russian judge at the Arbitral Tribunal, and led to Venezuela's revival of its claim to the disputed territory. Venezuela formally raised the issue again at an international level before the United Nations in 1962, four years before Guyana won independence from Britain. Venezuela cited the alleged Russia-UK deal noted above as an offence of collusion, as well as several improprieties and vices in the ruling, especially Ultra Vires, due to the fact that the referees drew the border between British Guiana, Brazil and Suriname, and also decreed freedom of navigation in the Amacuro and Barima rivers, exceeding the scope of powers granted by the arbitration treaty, in 1897. The Venezuelan claim of the nullity of the 1899 ruling has been acknowledged by several foreign scholars and jurists, such as J. Gillis Wetter of Sweden, in his work The International Arbitral Process (1979), awarded by the American Society of International Law. By searching on the British official archives, Wetter provided further evidence of the shady deal between Britain and Russia, what made him conclude that the ruling was marred by serious procedural and substantive defects, evidence that it was more a political compromise than a court ruling. Uruguayan jurist Eduardo Jiménez de Aréchaga, former President of the International Court of Justice, came to similar conclusions. At a meeting in Geneva on 17 February 1966, the governments of British Guiana, the United Kingdom and Venezuela signed the "Agreement to resolve the controversy over the frontier between Venezuela and British Guiana", best known thereafter as the Treaty of Geneva (1966). This agreement established the regulatory framework to be followed by the parties in order to resolve the issue. According to the treaty, a Mixed Commission was installed with the purpose of seeking satisfactory solutions for the practical settlement of the border controversy, but the parties never agreed to implement a solution within this Commission due to different interpretations of the treaty. Guyana argued that prior to starting the negotiations over the border issue, Venezuela should prove that the Arbitral Award of 1899 was null and void. Guyana did not accept that the 1899 decision was invalid, and held that its participation on the commission was only to resolve Venezuela's assertions. Rather than that, the Venezuelan counterparts argued that the Commission did not have a juridical nature or purpose but a deal-making one, so it should go ahead to find "a practical and satisfactory solution", as agreed in the treaty. Venezuela also claimed that the nullity of the Arbitral Award of 1899 was implicit, or otherwise the existence of the treaty would be meaningless. The fifth article of the Treaty of Geneva established the status of the disputed territories. The provisions state that no acts or activities taking place on the disputed territories while the Agreement is in force "shall constitute a basis for asserting, supporting or denying a claim to territorial sovereignty". The treaty also has a provision prohibiting both nations from pursuing the issue except through official inter-government channels. Venezuela recognises as territory of the new State the one which is located on the east of the right bank of the Essequibo River, and reiterates before the new State, and before the international community, that it expressly reserves its rights of territorial sovereignty over all the zone located on the west bank of the above-mentioned river. Therefore, the Guyana-Essequibo territory over which Venezuela expressly reserves its sovereign rights, limits on the east by the new State of Guyana, through the middle line of the Essequibo River, beginning from its source and on to its mouth in the Atlantic Ocean. Despite signing the Geneva Agreement in February 1966, aimed at resolving the border controversy, which provided that "no new claim or enlargement of an existing claim to territorial sovereignty in these territories (in Venezuela and British Guiana) shall be asserted while this agreement is in force, nor shall any claim whatsoever be asserted otherwise than in the Mixed Commission while that Commission is in being", Venezuela, a few months after signing the agreement sent a well-armed group of soldiers along with civilians and encroached upon and occupied territory by Guyana side of the border. This encroachment occurred, unknowing to Guyana Government, on the half of the island of Ankoko that Guyana claims as its own at the confluence of the boundary rivers, Cuyuni and Wenamu (Wenamo). It took the form of the introduction of military and civilian personnel and the establishment of an airstrip and the erection of other installations and structures, including a post office, school and military and police outposts. The incursion on the territory on Ankoko Island claimed by Guyana as its own by Venezuela was reported to the Guyanese authorities early in October 1966 by a diamond prospector who was in that forested and almost uninhabited area at the time. As a result, a Guyanese team of senior officials, including police officers, visited the vicinity on 12 October 1966 and verified that Venezuelan personnel were allegedly occupying the Guyana claimed side of the island where they had already constructed an airstrip. In 1969, three years after the independence of Guyana, a group of local ranchers and Amerindians in the town of Lethem broke out in open armed rebellion against the Guyanese government, and tried to secede. This event, called the Rupununi Uprising, was controlled by the Guyanese armed forces, which then accused Venezuela of supporting the rebellion. The Venezuelan government denied such allegations, although some of the ranchers involved were given refuge in her territory thereafter. Since they were born in Guayana Esequiba, the ranchers claimed entitlement to the Venezuelan citizenship and the government granted it. In 1970, after the expiration of the Mixed Commission established according to the Treaty of Geneva, Presidents Rafael Caldera and Forbes Burnham signed the Port of Spain Protocol, which declared a 12-year moratorium on Venezuela's reclamation of Guayana Esequiba, with the purpose of allowing both governments to promote cooperation and understanding while the border claim was in abeyance. Venezuelan maps produced since 1970 show the entire area from the eastern bank of the Essequibo, including the islands in the river, as Venezuelan territory. On some maps, the western Essequibo region is called the "Zone in Reclamation". In 1983 the deadline of the Port of Spain Protocol expired, and the Venezuelan President Luis Herrera Campins decided not to extend it anymore and resume the effective claim over the territory. Since then, the contacts between Venezuela and Guyana within the provisions of the Treaty of Geneva are under the recommendations of a UN Secretary General's representative, who can be changed from time to time under agreement by both parties. Diplomatic contacts between the two countries and the Secretary General's representative continue, but there have been some clashes. The Norwegian Dag Nylander appointed in March 2017, is the latest personal representative in these efforts selected by the UN Secretary General António Guterres. It was stated that if by December 2017 the UN understood that there was no "significant progress" in resolving the dispute, Guterres would refer the case to the International Court of Justice in The Hague, unless the two countries explicitly requested it not to do so. In January 2018, the UN referred the case. Map of Venezuela, showing the maritime areas in blue and Guayana Esequiba in gray. Guayana Esequiba in light green with the rest of Guayana in dark green. In September 2011, Guyana made an application before the United Nations' Commission on the Limits of the Continental Shelf in order to extend its continental shelf by a further 150 nautical miles (280 km; 170 mi). Since the Commission requests that the areas to be considered cannot be subject to any kind of territorial disputes, the Guyanese application disregarded the Venezuelan claim over Guayana Esequiba, by saying that "there are no disputes in the region relevant to this submission of data and information relating to the outer limits of the continental shelf beyond 200 nautical miles [370 km; 230 mi]." Venezuela sent an objection to the Commission, rejecting the Guyanese application and warning that Guyana had proposed a limit for its continental shelf including "the territory west of the Essequibo river, which is the subject of a territorial sovereignty dispute under the Geneva Agreement of 1966 and, within this framework, a matter for the good offices of the Secretary-General of the United Nations". Venezuela also said that Guyana consulted its neighbors Barbados, Suriname and Trinidad and Tobago before making the application, but did not do the same with Venezuela. "Such a lack of consultation with the Bolivarian Republic of Venezuela, serious in itself in that it violates the relevant rules, is inexplicable in so far as the coast whose projection is used by the Republic of Guyana in its attempt to extend the limits forms part of the disputed territory over which Venezuela demands and reiterates its claim to sovereignty rights", said the Venezuelan communiqué. Guyana has also awarded oil exploration rights in the disputed maritime areas, which has caused clashes with Venezuela. On 10 October 2013, the Venezuelan Navy detained an oil exploration vessel conducting seafloor surveys on behalf of the government of Guyana. The ship and its crew were escorted to the Venezuelan Margarita Island to be prosecuted. The Guyanese Ministry of Foreign Affairs said the vessel was in Guyanese waters, but its Venezuelan counterpart sent a diplomatic note to Guyana stating that the ship was conducting oil research in Venezuelan waters with no authorization from the country, and demanded an explanation. The vessel, Teknik Perdana, together with its crew, was released the next week, but its captain was charged with violating the Venezuelan exclusive economic zone. Venezuela considers the maritime areas in the Atlantic Ocean where the vessel was conducting its operations part of its "Atlantic front". In accordance with the border treaty signed between Venezuela and Trinidad and Tobago in 1990, Venezuela has a long Atlantic front as is shown in its official maps, regardless of its claim over Guayana Esequiba. Despite diplomatic protests from Venezuela, the government of Guyana awarded the American oil corporation Exxon a license to drill for oil in the disputed maritime area in early 2015. In May the government of Guyana announced that Exxon had indeed found promising results in their first round of drilling on the so-called Stabroek Block, an area offshore the Guayana Esequiba territory with a size of 26,800 km2 (10,300 sq mi). The company announced that further drillings would take place in the coming months to better evaluate the potential of the oil field. Venezuela responded to the declaration with a decree issued on 27 May 2015, including the maritime area in dispute in its national marine protection sphere, thus extending the area that the Venezuelan Navy controls into the disputed area. This in turn caused the government of Guyana to summon the Venezuelan ambassador for further explanation. The tensions have further intensified since and Guyana withdrew the operating license of Conviasa, the Venezuelan national airline, stranding a plane and passengers in Georgetown. This page is based on the Wikipedia article Guayana Esequiba; it is used under the Creative Commons Attribution-ShareAlike 3.0 Unported License (CC-BY-SA). You may redistribute it, verbatim or modified, providing that you comply with the terms of the CC-BY-SA.